Datian paintings are contemporary, yet classic; real and surreal; personal, though, universal; East meets West; most of all, they are filled with hope. Being the son of a well known painter-sculptor who studied in Paris in his youth, Datian was denied a formal education during the Cultural Revolution in China. He was sent to the countryside to work as a farm laborer. He had worked as a carpenter, tea-planter, violinist, puppet-maker and designer before he was finally recognized nationally as an outstand artist. 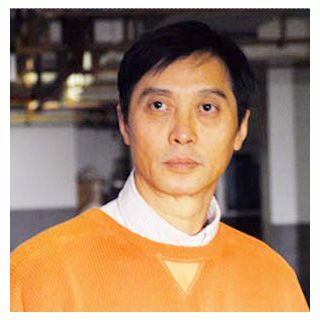 In 1984 Datian came to prominence by winning silver and bronze medals for his oil paintings "Life" and "Roots" at the China National Arts Exhibition. Datian created a bronze Urn commemorating the Chinese Olympic Games and four of his paintings are in the permanent collection of China's Fine Art Museum. There are also several memorial fountains in China that were designed by Datian. His “Old House” series, combining the two dimensional and three dimensional; the real and the surreal, again, won public and critical recognition during his one-man exhibition at the China Art Gallery in 1988. Datian’s paintings have been exhibited in New York, London, Tokyo and Moscow as well as Los Angeles. Datian came to the United States in April, 1989. Soon after, he began his new series “Horses” to commemorate “The Year of the Horse”. Again, his horse paintings received immediate accolades. 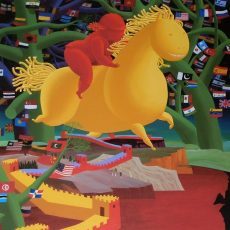 The U. S. Olympic Committee selected his equestrian painting to be the 1992 Banner Poster and again used the image on a poster for the 1996 Olympic Games. 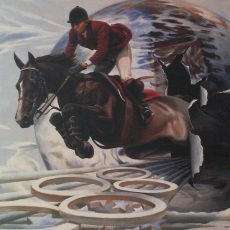 Datian’s exquisite equestrian paintings cast an immediate and lasting spell on his viewers. His art is both contemporary and classic, merging real and surreal, personal and universal, East and West, new and old; Datian is able to make his art timeless.